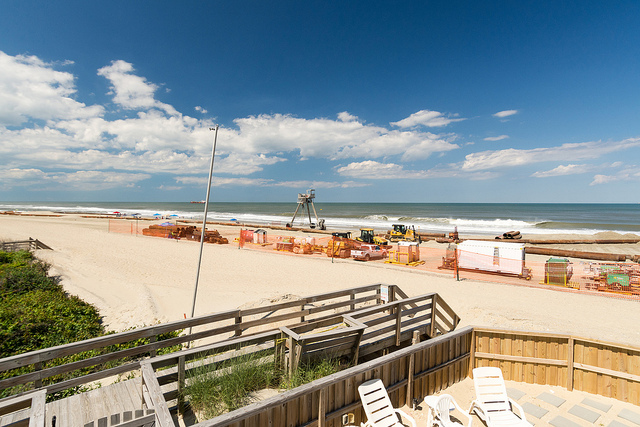 Contractors will begin deploying equipment any day now and re-nourishment of the beach in Nags Head is expected to start by the end of April. Town officials met with Nags Head’s beach nourishment dredging contractor, Great Lakes Dredge and Dock, on March 14, for a pre-construction meeting, according to a statement from the town. Great Lakes representatives said they plan to start mobilizing equipment before the end of the March and hope to begin construction in mid- to late-April. Two of the company’s hopper dredges, the Ellis Island and Liberty Island, will work the project. The Ellis Island, the first dredge on site, will start working in the vicinity of Mile Post 20, and after progressing south to the end of the project area near Mile Post 21, the vessel will then move north. The Liberty Island will begin working in early to mid-May. Great Lakes expects the dredge to begin working in the north end of the project area, around Mile Post 11 and will proceed south to eventually meet with the Ellis Island. Great Lakes representatives said that they expect construction to take 90 to 120 days, depending on weather and continued equipment operation. Please keep in mind this is a very preliminary schedule and is likely to change. The Federal Emergency Management Agency has notified the town that it will pay $16 million of the $42.7 million cost to cover sand losses attributed to Hurricane Matthew in 2016. But Nags Head will have to borrow the money upfront until FEMA provides a reimbursement after the project is finished. The town’s Board of Commissioners has approved two bond issues, one for the FEMA reimbursement amount and another for $11.38 million. See also Outer Banks Beach Nourishment (Twiddy) . . .